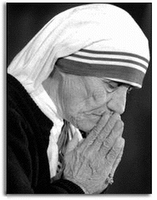 If we really want to pray, we must first learn to listen, for in the silence of the heart, God speaks. Jesus spent thirty years out of thirty-three in silence, began His public life by spending forty days in silence, and often retired alone to spend the night on a mountain in silence. He who spoke with authority, now spends His earthly life in silence. Let us adore Jesus in His Eucharistic silence! Yes, Jesus is always waiting for us in silence. In that silence He will listen to us, there He will speak to our soul, and there we will hear His voice. Interior silence is very difficult, but we must make the effort. In silence we will find new energy and true unity. The energy of God will be ours to do all things well. We will find the true unity of our thoughts with His thoughts, the unity of our prayers with His prayers, the unity of our actions with His actions, and the unity of our life with His life." 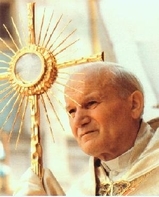 Saint John Paul II called Adoration of the Blessed Sacrament "a priceless treasure"
and a "wellspring of grace." 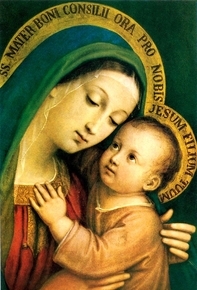 "The worship given to the Trinity of the Father and of the Son and of the Holy Spirit ... must fill our churches ... Adoration of Christ in this sacrament of love must also find expression in various forms of Eucharistic devotion: personal prayer before the Blessed Sacrament, hours of adoration, periods of exposition ... and Eucharistic benediction. ... Let us be generous with our time in going to meet him in adoration and in contemplation that is full of faith and ready to make reparation for the great faults and crimes of the world. May our adoration never cease." "O Most Blessed Virgin Mary, Mother of Christ and Mother of the church, with joy and wonder we seek to make our own your Magnificat, joining you in your hymn of thankfulness and love...God has called each of them by name...He has sent them forth to shine with the light of Christ...O Virgin of the Magnificat, fill their hearts with gratitude and enthusiasm for this vocation and mission. ..You who were together in prayer with the Apostles of the Upper Room, awaiting the coming of the Spirit of Pentecost, implore His renewed outpouring on the faithful... to bear much fruit for the life of the world."